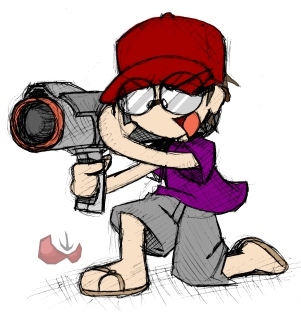 A Drawing of Lee by FuPoo. Lee has been hovering around the MFGG sites and boards since 2000, he was registered on every forum since then but didn't really become too active until early 05. He frequents the PPP, Forum Games, General Chat, and Art boards. He has yet to learn how to even program the most basic of game although he is a somewhat good spriter. He really doesn't have anyone he considers his friend as he sees himself as more of an annoyance than anything else. Undoubtedly, Lee's biggest achievements are his three minimate topics, two of which now dead, wherein many members, video game characters, and other people were made into minimates--two inch block figures made by Art Asylum. Lee also made skins of MFGGers for both the Sims 2 and Super Mario War. His current project is an attempt at making custom twelve-inch action figures of fellow members, it is currently at a stand-still thanks to the lack of a good paint sealer. Even though many MFGGers are greedy little things and love to see art of themselves and the fact that Lee offers too make duplicates of the figures for them his action figure project is incredibly unpopular. Lee never really has a plan for leaving but he is getting fed up with the current state of the forum where some of the jerks become popular because they are edgy, where those that work on stuff for others and a generally friendly are forgotten. This page was last edited on 9 August 2014, at 02:31.